The child is the cutest nature in the world. We love our children and others too. Because we know children are pretty close to the true spirit. Do you notice that your child suffers from enuresis? Either your child has the bed wetting problem or Adult has Enuresis problem? Actually, bedwetting disease is not only in the children. But there are a lot of adults who are also suffering from bed wetting disorder too. If anyone who is having a bedwetting problem. It is actually the source of embarrassment for that particular person. Because bedwetting can make your Nights difficult. it can suffer you from sleepovers. But you know, thanks to homeopathy medicines and homeopathic treatment. That now we can cure the bed wetting problem permanently. Find What is Homeopathy and How does homeopathic work? Homoeopathic medicines for Nocturnal Enuresis are actually natural medicines. By taking the small doses of Homeopathic remedies the bedwetting healing process. Homeopathic treatment is very effective and a gentle prose for the cure of bedwetting disease. Homoeopathic treatment is actually not only to cure the disease, but helps the whole cause of bed waiting. The main purpose of homoeopathic treatment for the bedwetting is actually to help the patient to control the anxiety, guilt and emotions associated with the bed wetting. It will help him to improve his sickness. 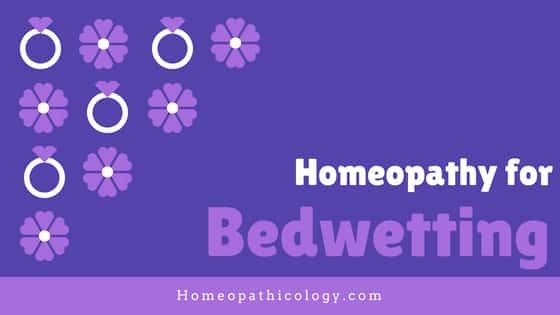 We can use different homeopathic remedies as a homeopathy treatment for the bed wetting patients. Becasues different remedies are for different symptmos and causes. Sepia 200 for bedwetting is best cure for Enuresis patients. If bedwetting immediately occurs after the sleep and the patient feel cold. We can give 3 doses of sepia 200 after 10 minutes. Causticum 30 or 200 Remedy is backbone for curing bedwetters . If you are patient feels unconscious during the last part of the night. If the beds at the last part of the night then your patient needs homeopathic remedy which is causticum. 3 doses of causticum 30 or 200 after 4 hours. Gelsemimum 30 homeopathic remedy works best for the nervous patient when causticum remedy fails. You can give gelsemium after 4 hours dose. If bedwetting patient is child having fat and fluffy body. He perspires easily and cold catching. Then calcium carbonicum 200 or 1M works best in such case. You can give three doses after a week. Pulsatilla 30 or 200 is bedwetting medicine. If patient loves open air with thirstlessness. Then Pulsatilla works best for such patients. You have to give only 6 doses but after 4 hours of each. Equisetum is one of the most important remedy for fearing patients. If your patient has nightmares and dreams. He is habitually bedwetter. Then Equisetum 30 is best for this case. You can give equisetum 30 after 4 hours. You can repeat as many doses as it takes to cure the disorder. Cina 30 or 200. If your patient either its adult or Child, having bedwetting due to worms. Then you can give Cina to cure this illness. Homeopathic remedy Cina can be given to such patients after 4 hours of each dose. You can give these biochemic h0meopathy medicines 4 hourly to your patient.